Manuel Pellegrini believes Chelsea's perfect start to the Premier League will provide motivation to his West Ham side. The two sides meet at the London Stadium on Sunday, live on Sky Sports Premier League, with West Ham boosted by ending a four-match losing streak with a 3-1 win over Everton. Chelsea, meanwhile, are top with five victories in as many matches, and kicked off their assault on the Europa League with a 1-0 win over Greek side PAOK on Thursday. 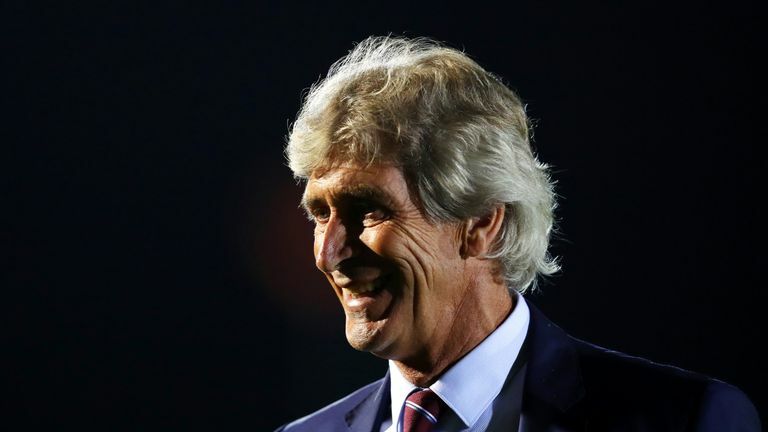 "I know that here in London there are a lot of derbies, but we have our first of the season against Chelsea, and they are at the top of the table so that is more of a motivation to beat them," Pellegrini said. "But, if we beat Chelsea it will not change our season. We will have just had six games, and not 38, so if we lose it will not be the final decision either. We must continue to try and improve every game, and every week." Pellegrini finally claimed his first league win as West Ham manager with an encouraging 3-1 defeat of Everton at Goodison Park. The 19-year-old Declan Rice impressed as the anchor in West Ham's midfield and it is likely he will get another chance to build on his performance against the Blues. Rice will face a stern test when he comes up against France's World Cup winner, N'Golo Kante. "Players always have an opportunity to play, and when they have the chance they must take that chance," Pellegrini added. "Declan did very well in the last game. He is a very young player, and he must know a lot of different things, learning about different players, and of course Kante is one midfielder that must be an example to him. Will Rice thrive in Wilshere's absence? "Chelsea is a team that moves the ball very quickly, so we are going to try to do the same thing, and of course the midfield have a very important role in that." West Ham face Chelsea at the London Stadium on Sunday with a 1:30pm kick-off, live on Sky.